This topic describes the Microsoft Dynamics 365 for Unified Operations mobile app and provides links to resources that can help you implement it in your organization. The mobile app was previously named Microsoft Dynamics 365 for Finance and Operations. Users can view, edit, and act on business data, even if they have intermittent network connectivity or their mobile devices are completely offline. When a device reestablishes a network connection, offline data operations are automatically synchronized with Dynamics 365 for Finance and Operations. IT admins or developers can build and publish mobile workspaces that have been tailored to their organization. The app uses your existing code assets. Therefore, you don't have to re-implement your validation procedures, business logic, or security configuration. 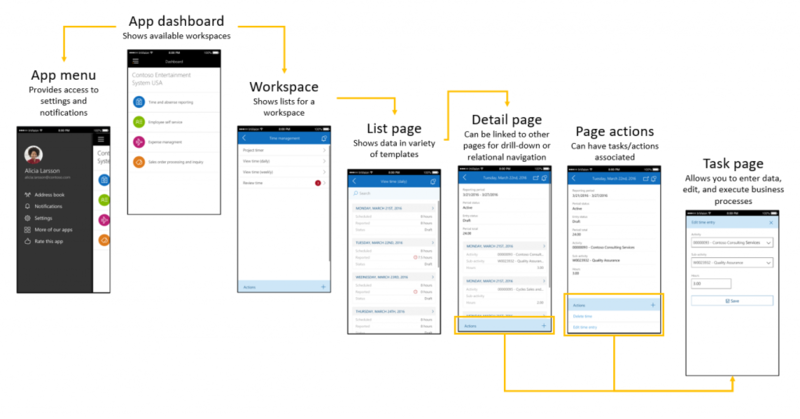 IT admins or developers can easily design mobile workspaces by using the point-and-click workspace designer that is included with the web client. IT admins or developers can optionally optimize the offline capabilities of workspaces by using the Business logic extensibility framework. Because data continues to be processed while a device is offline, your mobile scenarios remain rich and fluid, even if devices don't have constant network connectivity. Navigation in the mobile app consists of four basic concepts: the dashboard, workspaces, pages, and actions. When you start the app, you go to the dashboard. On the dashboard, you can see a list of workspaces that have been published. In each workspace, you can see a list of pages that are available for that workspace. Navigate to other pages for related data, such as entity details or lines. See a list of actions that are available for that page. Actions let you create or edit existing data. 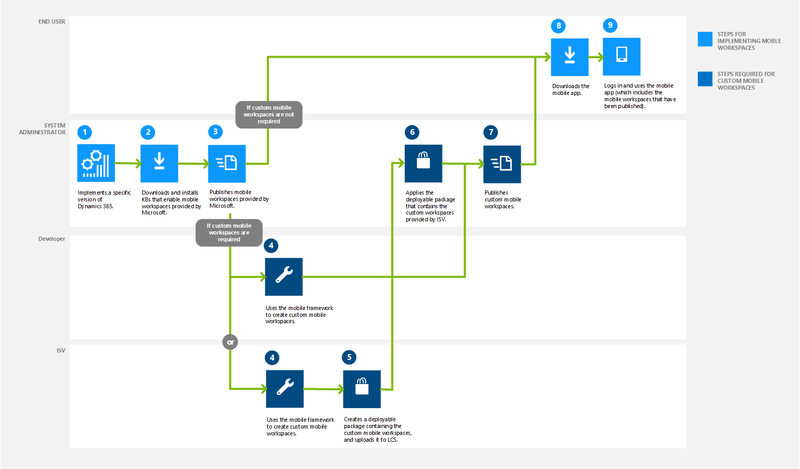 The following illustration shows the process for implementing both mobile workspaces that are provided by Microsoft and custom mobile workspaces. The following table includes links to resources that can help you implement both mobile workspaces that are provided by Microsoft and custom mobile workspaces. The numbers in the first column correspond to the numbered steps in the previous illustration. 1 System administrator Implement Finance and Operations in your organization. If you haven't yet deployed a version of Microsoft Dynamics 365, see Deploy a demo environment. To see a list of mobile workspaces that can be used, see Mobile workspaces recently released. 9 User Sign in, and use the mobile app. The app includes the mobile workspaces that have been published by the system administrator. To see a list of mobile workspaces that are provided by Microsoft, see Mobile workspaces recently released.